[FREE IRAN Project] In The Spirit Of Cyrus The Great :: View topic - What Would Kourosh Say? Posted: Fri Mar 17, 2006 10:13 pm Post subject: What Would Kourosh Say? How would Kourosh this resent? How would Kourosh his wrath have sent? What would Kourosh think of this zoo? Who are these fools, to destroy Israel�s tribe? Who are these traitors, to sell our land for a bribe? Who are these bigots, to preach nothing but intolerance? Who are these barbarians, to solve everything with violence? Where does each stand on justice, respect, and morality? The laws of which are based on tolerance, and which on barbarity? Why do you need Allah, or Mohammad? Of which are you, my dynasty, which brought pride and fame? Or of that of Taazi, which brought misery and shame? Thank you for the great inspirational writing. So, if any one of you have a chance go see it. Back to our country, when we get her back, I would like to see the name changed to UKP (United Kingdom of Persia).......what do you think? It would be nice to see a picture of it. I prefer Persia to Iran, that is one thing that separates us from the arabs. When you say "I am Iranian" they usually think you are an arab, and that is true everywhere in the world, but when you say "I am Persian" they know you are not an arab. Everything good that we have is under "Persian" not "Iranian" whether it is carpet, melon, cat etc. Sorry I don't know anything about the "cursed island in the Atlantic". Sorry I don't know anything about the "cursed island in the Atlantic"
I'm speaking of the UK (United Kingdom) also referred to as Britain! Funny you should mention this. As it happens, I literally was just there by that billboard one hour ago. I�m currently in LA celebrating Norouz with my family, and had to go by and see for myself. It�s true, and it�s beeeeeeeeeeeautiful. I had seen the picture as an e-mail, but it is something else in person. Also, there was a young Iranian with a collection of huge flags holding vigil underneath the billboard. Keep in mind that it is currently a bit cold, 11 pm, and raining. A friend of mine and his friends try to keep vigil by that billboard lest a Hezbollah moron gets the foolish idea to go by there and vandalize it. Ramin Etebar sent me an e-mail of that picture last week. I passed it on to friends, but didn�t keep it. Had I known you would have wanted to see it, I would have kept it and forwarded to you�.sorry. You might try PM-ing Ramin; he might still have it; or try Cyrus; he also might have it. 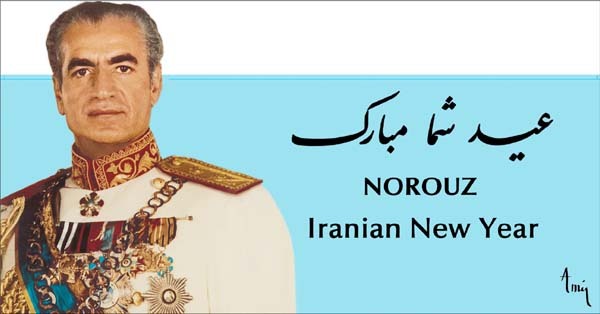 The picture is of Shah in his uniform, against a simple sky-blue background, and written words in English and Persian wishing a happy new year. Simple, and beautiful. As for the topic of �Iran vs. Persia,� I�ll give you my limited and abbreviated input. As you know, Iran means �land of the Aryans.� The Aryans are a somewhat broad group of people, and is very descriptive of the various tribal groups found in our country and slightly beyond. As such, it represents a good description of the constituent groups of our nation and people. As of times of old, the term �Iran� was actually widely used by Iranians to describe themselves. You may recall that the Sassanid kings described themselves as the �King of Iran and not Iran.� This also incidentally shows that the world was seen as only its relevance and importance in relation to Iran, and that Iran represented the most important aspect of the world. It also shows that Iranians always called their country �Iran,� and not Persia. Many are under the misconception that Reza Shah changed the name of the county from Persia to Iran. He did no such thing. Iran was always known to itself as Iran. The term Persia was a Greek derived description of our nation. To the Greeks, our nation was known as Persia. Knowing what I know about Greeks (and I know a lot about Greeks), I have an idea why this is so, though it is not based on any documented historical fact. The Greeks were for a very long time simply city-states, which means that each city was its own country. Each city acted independently, and was usually at war with the other Greek cities. As such, it was difficult for them to fathom or understand the concept of a group of people with a common ethnic background yet constituents of different cities and tribes as acting as a single nation. The concept of �Iran� therefore made no sense to them. What made sense was the concept of a single tribe. And at the time, the single most powerful tribe which was in charge of much of the administration and military was the Persian tribe. Thus�..Persia. And since the Romans were the successors of the Greeks, and then modern western civilization the successor of the Romans, the term Persia stuck in the west through the ages. To summarize, Iran was the term used by Iranians, while Persia was the term used by foreigners. However, semantics not withstanding, they both described the same thing, depending on who was doing the describing. When the ayatollah bozos took over, and Iran became a very unpopular nation in the world (especially after the hostage taking fiasco) many Iranians tried to distance themselves from these madmen by denying that they were �Iranians,� and referred to themselves as �Persians.� I think that this was not a wise move, and did us a disservice. It reinforced the idea that �Iran� was evil, instead of correctly explaining that it is in fact only the akhounds who are the evil ones, not �Iran� or �Iranians.� When an American asks if I�m �Persian,� I correct him by saying that I�m actually �Iranian,� though there is nothing derogatory about the term �Persian� either. Having said that, we cannot deny the entrenched term of �Persia� which exists in the western world. And we really shouldn�t try, either. The term Persia is also very powerful, and can serve us quite nicely. You�ll notice that in my writing, I purposely refer to our nation as Persia at times, and Iran at other times. That�s because I have no agenda to promote one over the other. I love both terms, and don�t want to lose any of the history associated with either term, whether that history is from an Iranian viewpoint or a western viewpoint. In the end, call it what you will. Its name is not its essence. Its spirit, its past, and its people are its essence. Posted: Tue Mar 21, 2006 1:05 pm Post subject: A NoRooz message from an Iranian who cares. A NoRooz message from an Iranian who cares. This year, Amir has outdone himself. View the attachment and you shall see! as one of the Top Fashion Desiner. Will you please consider adding Amir the designer to your thread regarding �Iranian Elites�?� I agree that Bijan belongs in that thread, but if Bijan belongs there, then so does Amir. Happy Nowruz to you, Cyrus, and thanks for all you do. Thank you Cyrus for posting this beautiful picture of shah. Bless his soul, maybe his picture in this Norouz will bring us a badly needed goodluck, maybe things will be turned around. I agree with Amir, lets put Amir the designer on the "Iranian Elites" thread, my suggestion is, remove Amanpour , and replace it with Amir. Amongst ourselves it is fine to be referred to as Iranian, but outside I prefer to say Pesian, and the reason is as small as the N & Q after IRA. To say I am Persian, people can never mix you up with an arab, say Iranian and yes, the next question is "do you speak arabic?" Thank you for posting the picture. And thank you "Amir" for this very noble act. Happy Nowruz, Good Idea it is done. Wow!!! This has got to be the best poem I have ever read on Iran's current "situation." Its so well written. AmirN, this is a masterpiece.